1. In a large mixing bowl, sift the flours and salt together. Add oil to the mixture. Slowly add the water, a little at a time, and mix to form soft dough. Turn the dough out onto a work surface and knead for 10 minutes, until dough is smooth and pliable. Place dough in a clean bowl and set aside covered for 30 minutes. 2. In a deep-frying pan, heat the oil for frying over medium-high heat. 3. Knead the dough for a minute and then divide into 20 equal portions. Keep covered until ready to use. Take one portion at a time and make a round patty, dusting both sides with flour. With a floured rolling pin, roll the patty into a 4-inch circle. Transfer to a platter, and place a plastic wrap on top to prevent from drying. Repeat with the remaining dough, making sure the work surface, dough, and rolling pin are floured to prevent the dough from sticking. Place the rounds on the platter, making sure the plastic wrap is in between each round to prevent sticking. 4. The oil should be very hot (375°). To test the oil, drop a piece of dough the size of a pea into the oil. If it floats, the oil is ready; if it sinks, the oil is not hot enough. 5. Slowly drop one poori into the oil. It will start to sizzle. Gently tap it with a slotted spoon, pushing it under the surface of the oil. 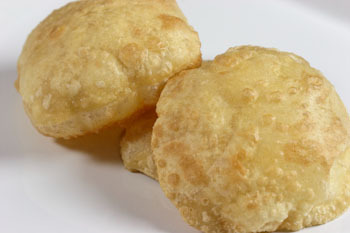 Within a few seconds, the poori will puff up and the underside will become slightly brown. Gently flip the poori with the spoon and cook it on the other side for a few seconds. Remove the poori and drain it on a tray lined with paper towels. Repeat the process with the remaining dough and serve immediately. Serve with lentils or any curry; my favorite is spicy potato curry. These fluffy, golden pooris are aromatic and luscious in taste. I love to serve this when we have guests, for the “wow” factor: when the pooris are deep fried, they puff up and gradually sink as they release hot air. To ensure maximum taste, they are best when served immediately.